January 2009 was my first January back in Williams Lake and I was so excited and eager to be a farmer. I had behind me a whole five months experience living in a camper van on various farms around the province, as well as the time that went into the 1/3 of an acre we’d managed to prepare for the garden before the snow hit the previous fall. I had spent the winter talking to anyone who would listen (and probably many who were just being polite) about my new-found passion for vegetable farming. And then at the end of January I attended my initial Food Policy Council meeting and had my first realization that I didn’t know even the tiniest fraction of what I was getting into or what I was talking about. The topic of the meeting was the future opening of the Cariboo Growers’ Co-op, still in the planning stages at this time. I sat there all perky and proud to be a member of the group: listening, contributing when I felt I had something to add, and just generally basking in the camaraderie of my fellow farmers. I then had my first of many humbling experiences. I don’t think I managed to hear the rest of the meeting. I remember fidgeting in my chair, all illusions that I knew what I was doing having vanished, thinking, “I need to go home now, there’s something I have to do.” And it was all I could do to not run out of that meeting, find a phone, and call home to tell my farming partner that we had to get that seed order in NOW as we were already almost two months behind. Ordering seeds had, quite frankly, not actually occurred to me yet. Since then I’ve laughed at myself for this moment every year when I first receive my seed catalogues. Seed ordering doesn’t stress me out anymore; it is one of my favourite things. That moment each January when I open the mailbox to find the first seed catalogues of the year always feels like Christmas and I can hardly wait to get home and open them. 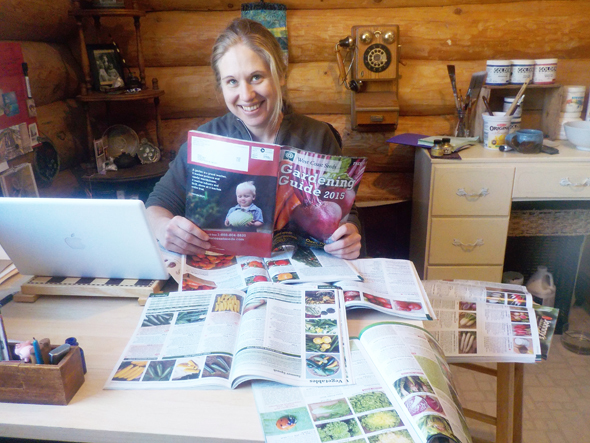 I have multiple copies of the same catalogues and for the next few months, even after I’ve ordered all of my seeds, they can be found in both bathrooms, next to the bed, in the office, downstairs beside the fire, and even in my purse. I spend hours poring over the pages, gazing at the beautiful pictures and fantasizing about the incredibly beautiful, lush, weed-free, pest-free garden I just know I’m going to have this year. Every gardener does this, I’m sure. We have to. Each year we tell ourselves that this year will be the year of our best garden ever. Sometimes it’s true; sometimes it isn’t, but it’s the dream that keeps us going. I have become better at ordering each year too. I have a better understanding now of what is actually possible, especially for our short and unpredictable growing season. Sometimes I actually tear out the pages for melons or winter squash just so I won’t be tempted. We often get frost every month of the year at Road’s End, and anything that has a growing season of more than 90 days that isn’t incredibly cold tolerant is really not worth the effort. The limited greenhouse space I do have is prime real estate and I must use it sparingly. It’s devastating to baby a plant for months only to have it freeze to death just before it reaches fruition. But even without the warmer weather crops, there are still hundreds of options and way too much scope for imagination. One year, looking through the catalogues, the myriad purple vegetables available intrigued me. I began imagining a purple section for the garden and for market. Just think how interesting a display I could come up with for market with purple cauliflower, purple kohlrabi, purple carrots, purple peppers, purple eggplant, purple potatoes, purple beans purple kale… I’m still thinking about it, but perhaps this is just too much of an example of playing with my food. Over the years I have also discovered which varieties grow best in my particular microclimate and I have begun to cut back on the ridiculous number of other varieties I try to grow. Do I really need to grow eight varieties of peas when I know the three that do best here? Is it necessary to try five different types of romaine when I know the two that my customers prefer? And must I really order those new broccoli seeds in the Johnny’s catalogue just because they’re called, “Amadeus?” (Actually the answer to that last question is probably: yes, I do need broccoli named Amadeus, obviously). I always justify my overzealous ordering with the fact that I’m against monocultures and we are losing all sorts of varieties of plants because of commercial farms growing only one or two varieties that grow best and ship well. Even moderating my seed ordering, though, I still grew over 50 varieties last year. I also make an effort to grow an open-pollinated or heritage variety for every hybrid I use. Hybrid seeds are bred to grow uniform plants that perform well, and have high yields. They are not to be confused with GMO seeds. They are bred, not engineered, but you cannot save seed from them because they are all genetically identical. Heritage varieties are often more finicky, with smaller yields, but they have wonderful flavours, interesting colours and shapes, and their seed, which has been cared for and propagated for at least a century, can be saved. It is important to me to grow these seeds and to try to save them, too. And even though they are more expensive, I usually choose organic seed. This is partly because I want to support the growth of organic seed, but also because if you are growing organically, you want seed from the plants that stood up the best to disease, pests, and weed competition. They will be stronger plants. Oh the possibilities! I could write about this for hours, and my garden knowledge is still so very limited. Good luck with your seed ordering, everyone. And don’t worry; you still have lots of time. Don’t tell anyone, but I never do get my order in until February.